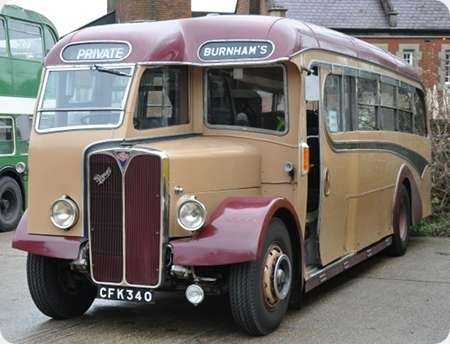 CFK 340 is an AEC Regal III with Burlingham C33F body from the fleet of Burnham’s of Worcester. She dates from 1948 and, in this view in Winchester on 1 January, 2012, she was in Roger Burdett’s collection. I believe that, despite the Worcester address and registration, the firm’s base was actually in Bromyard, Herefordshire, in another case of geography and the Post Office not being in agreement. Ealing might be expected to have a TW or UB postcode, as it is in the old Middlesex, but it has a London W5 mark. This photo has cheered me up on a very soggy Sunday morn! I’m not sure I’ve ever seen many early post-war Burlingahm bodies; this one being very traditional and attractive. To me the AEC chromed rads always look more stylish that the Leyland ones. I notice that Bromyard is equidistant from both Worcester and Hereford at 15 miles, with Bromyard about 6 miles from the county boundaries. Maybe they tended to go into Worcester more frequently/easily. Postal addresses, then postcodes, have a mystery of their own. Yateley’s in Hampshire, but postally it’s Yateley, Camberley, Surrey! I think that they were related to sorting offices, not an important distinction now. And why do folk still stick with Middx, 40-odd years after what was left of it disappeared? This vehicle was restored by brothers, John, and the late Alan Purvis, of Seaburn, which to the North of the river Wear, but is part of Sunderland. Although it was never part of their fleet, after restoration it was in the livery of Carney of Sunderland, it was later restored to original, but I don’t know if that was before or after it changed hands. The H & E Burnham Ltd. being in a half circle format with Bromyard and Worcestor as above followed by the two telephone numbers. It was repainted before it changed hands being part of the sale to Mr R. Smith of Hexham in Northumberland in 1990’s remaining with him till 2009 when it went to Steve Morris at Quantock Heritage at Taunton a year later it is seen in Rodger Burdetts collection in Coventry where it remains today still in original Burnhams livery. We used to live in a small village in South Oxfordshire…. Our local post office delivery centre was part of the Central Reading Post Office area, so although we lived over 20 miles from Reading, our postal address and postcode always ended in Reading, Berkshire and bore no relation to our actual location….This also made dealing with the local South Oxfordshire District Council a bit of a hit and miss affair as more often than not they used to refer us to Reading Council whenever we asked for their help or made enquiries about services…. To this day, it causes some confusion, especially when using drop down menus on web sites…. The approximate date of this photo is 1980 no later than 1981 definitely is CFK 340. Not a good photo but original is ageing. 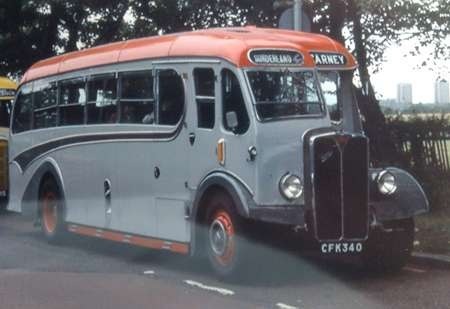 Original Burnham livery from 1948 after this it is then seen in Carney livery. A fascinating photo of ‘before’! Is this when she was rescued, Alan? Restoration was certainly a daunting task. Burnhams had a garage in Worcester 50/60’s corner of what is now City Walls rd & St Martins Gate. They had a school contract between Dines Green & Henwick Grove the coach I remember was also a Burlingham but had the more rounded Seagull body it was described as a two stroke. The vehicle broke piston rings at Easter and is off the road awaiting delivery of a replacement engine promised but with no confirmed date. The seats internally still have horse hair and coil springs and are exceptionally comfortable. Yes to your question,I believe couple of panels removed to eye extent of rot. Restoration only took 8 months mainly after working hours and weekends a accolade to the Two brothers Alan & John to the extremely high standard, the refurbished coach was soon to be seen on Show/rally circuit. Reference your soggy Sunday words next time we have a day like that I will post a photo of DFK 214 another Ex.Burnhams I had this in mind to run after CFK ends of which I have more detail. Both CFK 340 & DFK 214 were almost complete coaches each refurbished from own units with spares obtained from another coach. Not only bought as a pair but of 3, was another EFK 760 this was likewise almost complete. All 3 coaches were new to Burnhams. CFK 340 5/1948, a MK III C33F. EFK 760 7/1951 was a MK IV C39C. All 3 are currently in preservation. Type DFK 214 into your search engine, and you will be directed to this site of Pervis Bros, bus restorers. On the site there are photos of several of their restorations, including one of this vehicle in the livery of Carney, standing alongside a restored DFK. There is also a photo of the two together in Burnham livery. Here is a restored view now in R. W.Carney livery. 8 months on from the view in Burnhams livery prior to restoration. 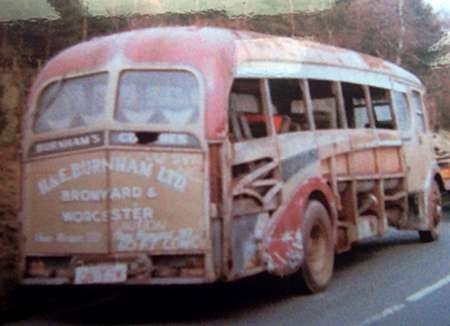 Alan, for a number of years there is/was an Alexander Bluebird ‘Northern’ half cab Burlingham bodied ‘Daimler? I think, parked up in former NCT depot at Slatyford. Is that it behind CFK? Burnhams were Worcester-based and had NO connection with Bromyard. A large rural stage network was sold to Midland Red in 1938 along with a Worcester- Aberystwyth express service- Burnhams then carried on as private hire operators. All this is confirmed info; what follows isn’t checked, but I seem to remember that they carried on in a small way until c1975 when everything was auctioned off – including some elderly stock which had been kept on, decaying gently a la Mulleys of Ixworth.This is presumably how CFK etc survived. Looking again carefully at the rear of the unrestored vehicle should solve the Bromyard Worcestershire discussion once and for all. It says "Bromyard AND Worcester" with no mention of a County. Thus I assume the company maintained bases in both locations. Yes you are correct well spotted. I have other similar photo’s showing more of both coaches. Without checking them my memory states it is BMS 415 if you input the reg. into a search engine there is photo of it standing alone in depot. I believe the photo of CFK/BMS may well been taking in lay-by outside Newcastle on old A1 back ground view of Town Moor with high rise flats in view. Lay by being a meeting point on way to Scottish show in 1987. Alan Coulson. Phil Drake, I’m grateful for your comments regarding Burnhams. Having done extensive history of CFK 340,(DFK 214-EFK 760). I find the NO connection Bromyard strange as all the photo’s of Burnhams show both Worcestor and Bromyard with telephone numbers. My information is they were known to have premises in Cornmarket at Clifton on Teme, Worcestor and Rowberry Street Bromyard. I have recently seen photo of Leyland Cheeta coach with Burlingham body new to them in 1938 the year they were sold to Midland Red showing Bromyard and Worcestor. In this photo the and is in capitols. AND, in a rear view of coach.In all other photo’s the and is seen as & this is clearly seen on unrestored coach. CFK 340 was purchased in the 2nd auction 1979 from the big shed at Clifton. Any further comments are gratefully accepted. As mentioned above my notes show company operated from both Worcestor and Bromyard. I was friends with one of the sons of the company owner in the ’70s. There were a couple of retired buses in their garden in Kempsey. I believe that they were the first vehicles the firm owned and were of sentimental value. Might this be one of them? My understanding was that the vehicles were kept long after the operator side ceased. I would say CFK 340 may not have been one of the vechicle’s in the garden as it is known they ran earlier coaches CFK being new in 1948. From earlier in the thread I have seen a photo of a Leyland in 1938 around the time the company was split from stage services to private hire this coach was in all white livery. Disgraced itself this week with an Autovac failure on the A46, needed a suspended tow back to base.